At 456 pages, Garanti Bank’s mammoth integrated report is described by Mervyn King, chairman of the International Integrated Reporting Council (IIRC), as the ‘head of the octopus’ that represents each arm of the 71-year-old bank’s reporting structure. Then in 2017 the Garanti team decided the time had come to ‘completely transform’ its reporting, publishing bilingual versions – in English and Turkish – of its integrated report on March 1, 2018. ‘Globally and domestically there is definitely a growing interest in better corporate reporting,’ says Saygin. ‘[And] we believed integrated reporting was the right way to report.’ She adds that the bank felt this approach would ‘provide a holistic assessment rather than offering stand-alone sustainability and financial reporting targeted at selected stakeholders’. Garanti’s approach to long-term value creation is also aligned with integrated reporting, Saygin notes, as the goal is to communicate the company’s total value creation story ‘in a clear and comprehensive way to all stakeholders’. The basis of the report is the materiality analysis, she explains, ‘which enables us to identify the most relevant and important topics for Garanti and its stakeholders.’ This section of the report examines a range of topics – from financial performance to human capital and digitalization – and assesses their materiality using a four-step assessment called ‘four-factor impact analysis’ as well as interviews with senior management and feedback from stakeholders. ‘Moreover, the report is structured upon investors’ demands such as KPIs, current information and forward-looking guidance and our responsible and sustainable development plan,’ says Saygin. The result, she adds, is that ‘in our integrated annual report, the connection between the material issues, business strategy and performance is clearly established’. The result – the amount of information integrated into a single report and the fact the report was delivered in both Turkish and English on the same day – is also ‘a true first in Turkey,’ says Saygin. A report of this size is almost guaranteed to bring with it challenges. ‘Running a project like this for the first time is always difficult,’ says Saygin, who lists a number of the key issues overcome on the project, such as reaching a consensus with departments on which data should be disclosed and convincing involved parties to disclose more than just the sheer number of meetings involved. 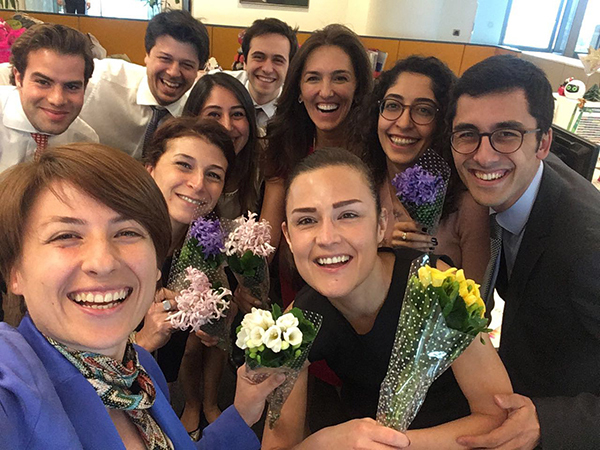 ‘All these proved to be challenging, even in a very transparent, data-leveraging and digitalized bank such as Garanti,’ she says. The report also shaped CEO Ali Fuat Erbil’s presentation at the bank’s March AGM with the meeting broadcast live (and then posted to the company’s IR site) in what Saygin says is another first for a Turkish company. So how would she describe the 456-page report in three words? ‘A rewarding journey,’ she says.